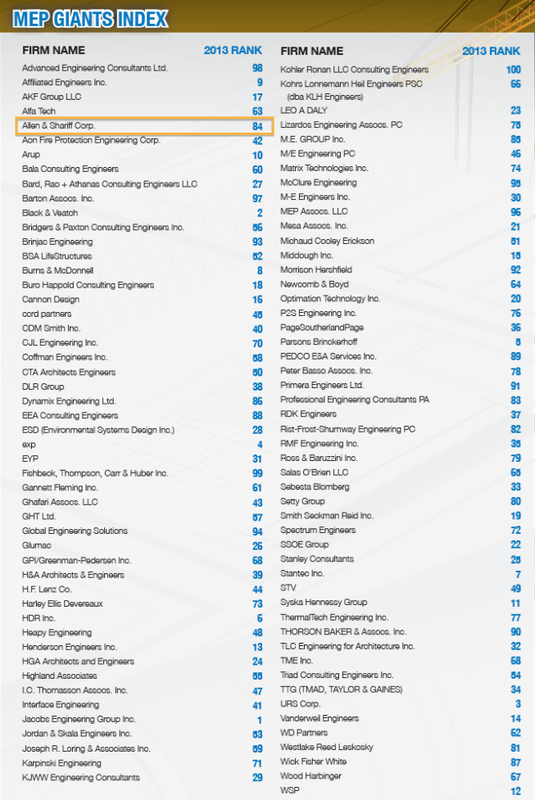 Allen & Shariff Corp. ranked #84 on the 2013 MEP Giants list. Oak Brook, Ill., — Consulting-Specifying Engineer, a CFE Media publication, announces the 2013 MEP Giants. The 100 engineering firms distinguished by this award will be recognized in the August 2013 issue, online at www.csemag.com/giants, and at a dinner and networking event in Chicago. 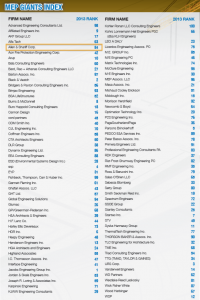 The MEP Giants program, sponsored by Eaton, lists the top mechanical, electrical, plumbing (MEP), and fire protection engineering firms in the United States. The in-depth analysis of these firms reveals what’s going on in the industry, and how it has changed over the past few years. The 2013 MEP Giants have earned this title by proving that they find opportunity in the many changes in the building engineering industry. 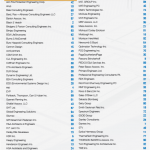 The 100 design firms selected as the 2013 MEP Giants continuously push the boundaries in the mechanical, electrical, plumbing, and fire protection engineering sectors, providing the most cutting-edge technology in the consulting engineering community. Data collected from these firms over the past several years has helped Consulting-Specifying Engineer to analyze and identify trends in the marketplace.